It's time for another Bridal Bazaar. This time the massive wedding show will be at the Del Mar Fairgrounds. My best advice is that you don't need to see everything. It's better to spend some quality time with a few vendors. I see too many people ware themselves out trying to see everything. Yet by the end of the day, they're no closer picking their vendors than when they walked in. Don't let that be you! We'll be in booth 23. 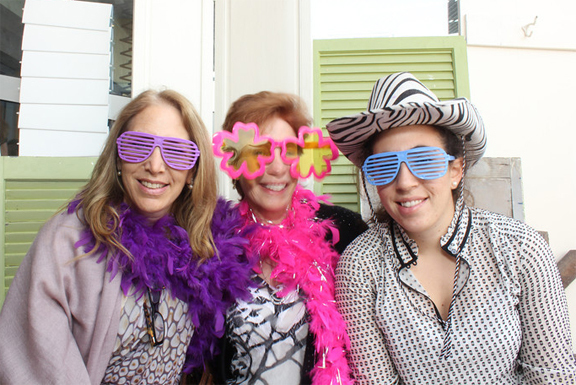 Make Starlight Photo Booth one of your stops and spend some quality time with us. Sometimes, the setting of an event is so beautiful, or interesting, you may not even want to use a backdrop with your photo booth rental. The open air photo booth is as flexible as it gets. Each photo booth is equipped with a high quality, digital SLR professional camera. Our photo booth attendants are trained to use the equipment to capture the best photos possible. Even outdoors with changing lighting conditions, we can keep the pictures looking great. Since you get all of the digital photos after the event, we know you will cherish the pictures forever. The top picture was took advantage of the country setting. The bottom picture was on a yacht. The bride wanted to include the San Diego Bay in her photos. Our client brought her own dry-erase signs for her photo booth rental last night. They sell the material at Office Depot. She just cut it in the shape of speech bubbles and attached handles with tape. As for the teeth of the lady on the left, we did not provide those. I saw her pull them out of her purse before posing for this photo strip. Now that's a true photo booth fan, she carries her own favorite prop! Every November, we stock up on photo booth props from the temporary costume stores that pop up just for Halloween. Props keep the photo booth experience fun and interesting. My favorite prop this year is the rubber cobra in the picture below. It looks a little scary, but people seem to love it. I'm seeing it show up in tons of our photos. We have more props than we can possibly send on every job. If there's a specific theme or prop you're looing for, let us know when you rent your photo booth from us. We may have something to fit your needs. You are also welcome to provide special props of your own. Having a great variety of props makes for excellent photos, and it also encourages more use of the photo booth. People will come back over and over to use different props in different ways. Props definitely help you get the most out of your photo booth rental. A true photo booth experience beats a guy with a camera every time. But what is it that makes it a true photo booth experience? There are a few features you must have in order for it to be the real deal. First, instant printing is a must. The immediate gratification of being able to walk away with your photo strips is an essential part of the photo booth experience. Secondly, the on screen preview is the part of the photo taking process that gets the most laughs. After a picture is snapped, a proper photo booth will display the picture, usually to a great response. Lastly, automation. There is a huge difference between the automated experience of a photo booth vs. a photographer holding a camera and telling everyone to "say cheese!" Just like great art is sometimes born from the limitations of a medium, the tic toc of the photo booth's timer drives people's creativity. If you're shopping around to rent a photo booth for a party, wedding, corporate event or special occasion, make sure the photo booth experience you're getting is the real deal. The client below used some shutters and doors for their photo booth backdrop. The colors matched the theme of the event too. A really nice touch! The decor of the wedding below had a rustic feel to it. Shooting against a barn wall was the perfect way to incorporate the rustic feel into all their photo booth pictures. Starlight Photo Booth Is Back From the Wedding MBA! Starlight Photo Booth spent all this week in Las Vegas learning the latest trends in the wedding industry at the Wedding MBA. We picked up some valuable tools that will help us provide even better service to all of our clients. Managing a company with multiple photo booths and a staff of photo booth operators takes some special tools and software. We're switching to a better event management system thanks to information we got from talking to some of the hundreds of fellow wedding vendors at the show. We also got an idea for a new product to accompany our photo booth rentals. I can't talk too much about it until it's finished, but I can tell you it solves the problem of picking creative poses during photo sessions! Be prepared to have your mind blown, POW! The best part of the show was connecting with so many like-minded wedding vendors who provide top notch service to their clients. We freely exchanged ideas on how to make our product more creative, and our business run smoothly. These improvements will be rolling out soon just for you! I had the opportunity to be the photo booth attendant at Jamie and Brian's wedding in Coronado recently. Whenever I'm operating one of our photo booths, I love to look for new and fun ways to improve what we do. I decided I would do something a little different for their memory book. There's a spot on the cover of the photo album to insert a photo. Instead of cutting a photo strip to fit in the slot provided, I printed a 4x6 copy of my favorite photo of them and used it for the cover. Then I printed a few of my other favorite photos in 4x6 and made a page for them, along with a page of photo strips that include the bride and groom. It was definitely a nice touch, and the larger prints take advantage of our high quality images. Of course the rest of the photo album was filled with pictures and glad tidings from their guests. I think it's safe to say everyone had a great time as usual. Another happy client for Starlight Photo Booth! 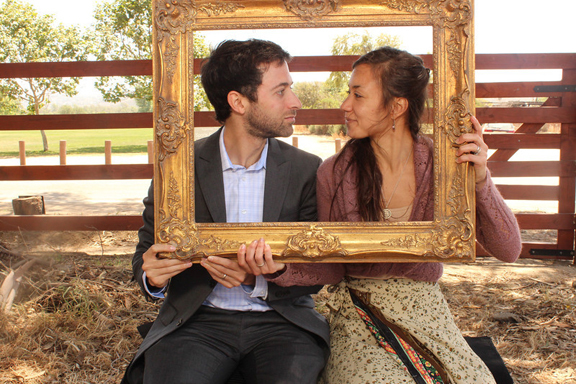 Starlight Photo Booth will be showing off our rental photo booths at the San Diego Bridal Bazaar on Sunday, July 28, 2013. We will have a photo booth set up and ready to try out. Come see why it's better to keep your photo booth out in the open, rather than keep the fun hidden in a box. The show is at the San Diego Convention Center, Hall C. We will be there from 10:00am to 4:00pm ready to demo our booth and answer questions. Come see us! Pat's guests partied at theSouth Mesa Hall at Camp Pendleton. Family and friends posed for silly pictures and everyone walked away with a copy. Of course Pat gets to keep the originals on a thumb drive! We want to thank Susan who organized Pat's awesome celebration and included us in the fun. Here are a few pictures from the party. In addition to weddings, we also rent photo booths for birthday parties like Pat's, anniversary parties, corporate functions, holiday parties, promotional events and more. For more information about renting a photo booth in San Diego, please visit our main page at StarlightPhotoBooth.com. Eran & Jason's wedding was at the very unique Inn At The Park in San Diego. The roof top location (formerly known as The Park Manor) overlooks downtown San Diego, and their ceremony overlooked iconic Balboa Park. We set up the photo booth on the side of the roof top that overlooks the San Diego Bay. Eran and Jason used one of our custom backdrops called "Soho." Check out the picture at the bottom, one guest was dressed in "camouflage." Another fun night of picture taking at Tanika & Matt's wedding. Their guests took dozens of photo sessions with silly props and fun poses. Everyone got to keep their photo strips, and extra copies were printed for the memory book. I'm sure Tanika & Matt are glad the memories are preserved for them to enjoy forever. Here are some of the photos taken in the Starlight Photo Booth. We have to admit it, booth envy made us purchase an obsolete product. When we added a traditional, enclosed photo booth to our fleet, it was for the clients who asked us "where's the booth?" We called it The Galaxy, and it served us well for a few months. But then something interesting happened. We signed the lease on an office in Mission Valley where people could come in and try our booths before booking. Once our clients could compare our open and enclosed booths in action side by side, people stopped booking the enclosed booth! They loved the group shots that are possible with the open layout so much, the idea of containing the fun in a little box didn't seem so great any more. After a year of data, we consider the argument of open vs. enclosed photo booths SETTLED! Accordingly, we have discontinued taking new bookings for our enclosed booth and added a new, open Starlight Photo Booth to our fleet. We've also upgraded our existing booths to include some awesome and unique features. Starting immediately, all of our booths have video capability, as well as the ability to allow guests to email themselves their pictures. We've added many more custom layouts and more features are coming soon. We're excited for our new focus and look forward to an awesome 2012! Starlight Photo Booth was voted #1 San Diego Photo Booth Rental company on the Bridal Insider People's Choice Awards for 2011! Thanks to all of our clients who responded to our call to action on Facebook and via email. We're looking forward to another great year of photo booth fun! Since I'm announcing good news, I would also like to welcome our new team member, Hethyr Hickman. Hethyr is our new Office Manager. In the short time she has been here, she has already improved our turn around time on uploading images to our online gallery. Her customer service and organizational skills are exactly what we need to take this company to the next level of excellence. If you're shopping around for a photo booth for a wedding or other social event, you may have noticed there are now two radically different types available. There's the traditional arcade style photo booth, with a bench, a roof and privacy curtains. But there's also a new open design photo booth. The open layout booth ditches the classic boxed-in look, in favor of just having a camera facing a backdrop. Both of these configurations have their pros and cons. Which ever style you decide on, try to base your decision on the entertainment value the booth will provide to your event. Be sure to check with your venue too. Most catering managers have seen photo booths in their venue and they may have some thoughts about what works best for their particular location. To get the most out of the experience, remember that a photo booth is a part of the entertainment. These tips will help you make the booth as entertaining as possible, and therefore, get your guests to take more pictures! 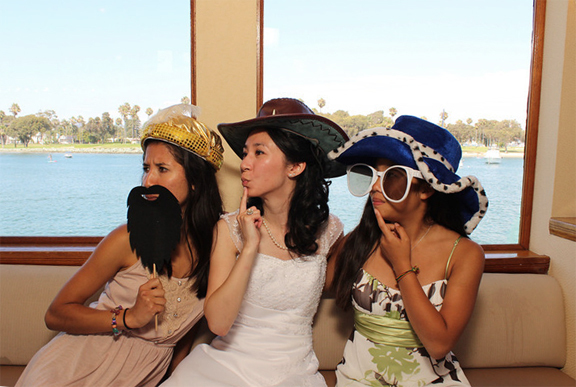 For more information about a San Diego Photo Booth rental, fill out OUR FORM to find our current specials.